The McCarron & Co design team were recently invited to an exclusive chef’s table dining experience at Miele’s London Experience Centre. This was hosted by Miele’s Nordic Cuisine Chef Martyn Meid. Having begun his career in the kitchens of his home town Klaipeda, a small fishing port town in Lithuania, this influence is prominent throughout his cuisine, combining his passion for Nordic techniques and flavours with continental ingredients. Martyn is head chef at INK in Bethnal Green and hosts regular events for Miele. The event was arranged to celebrate the ongoing partnership with Miele and McCarron & Co with the emphasis on the three pillars of the Miele’s brand philosophy which is also held by ourselves as luxury bespoke furniture makers and designers: Precision. Passion. Perfection. Upon arrival, we were greeted by our hosts Joanne and Martyn and were quickly offered a glass of champagne (after a long day at the showroom that was the ‘Perfection’ box ticked!). 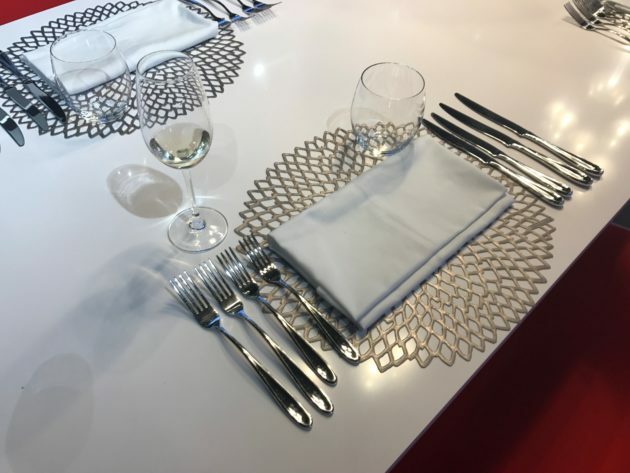 After a brief talk on the continued collaboration and support offered by Miele to luxury bespoke furniture makers, we were ready for the main event – 5 course tasting menu. 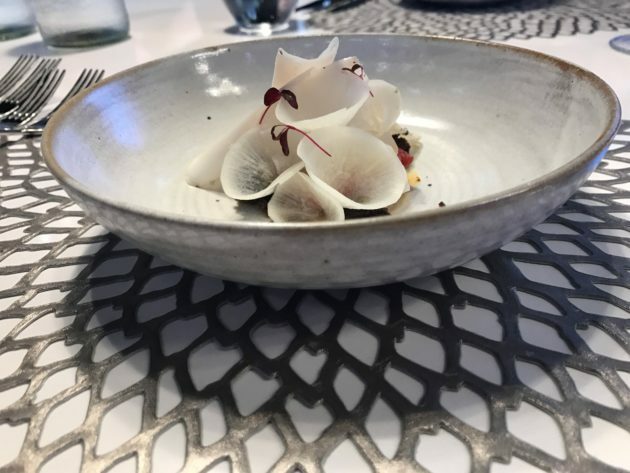 As the first course arrived – pickled tomato, poached scallop with bread crumbs – the precision and attention to detail in the dish was clearly evident and didn’t need any further explanation. The food looked amazing and almost like a bouquet of flowers and the aromas were more than inviting. 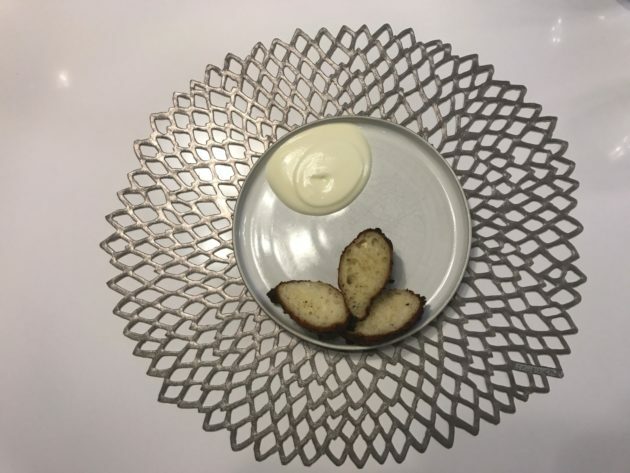 The plate chosen for the dish echoed the simplicity and monochrome look of the food. The second course was another visual delight – fermented, salted, fresh cucumber with King crab -. 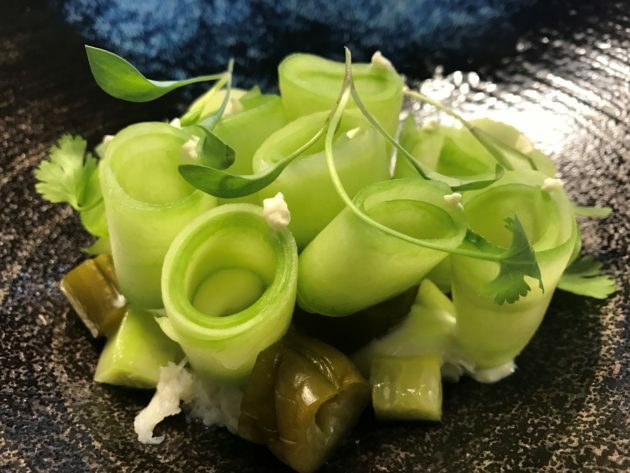 The ribbons of pickled cucumber were delicately rolled and perfectly placed on a dark earthen-ware plate to give maximum impact and contrast with the vibrant green colours. This quickly put an end to the discussion that chef’s book-end their tasting menus with the most visually impacting dishes. The third course highlighted Martyn’s passion for food. 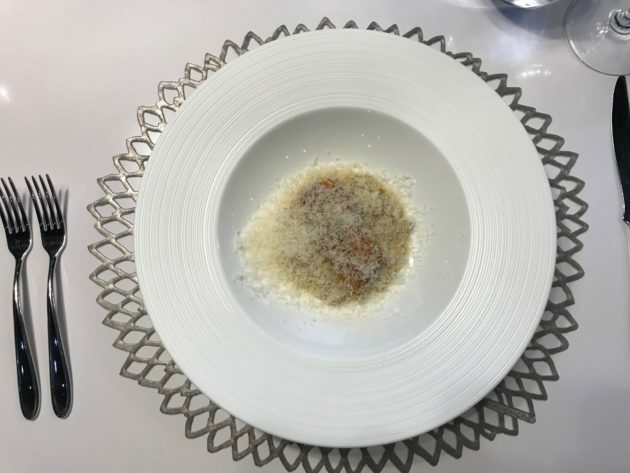 Martyn introduced the course – red mullet, pearl barley risotto with 62 months aged cheese – with a brief explanation of how the cheese was made and its use in Nordic cuisine over the years. The dish was simpler in its presentation but the flavours and textures were amazing. This was my favourite dish of the night and I wouldn’t usually order fish off the menu given the choice. 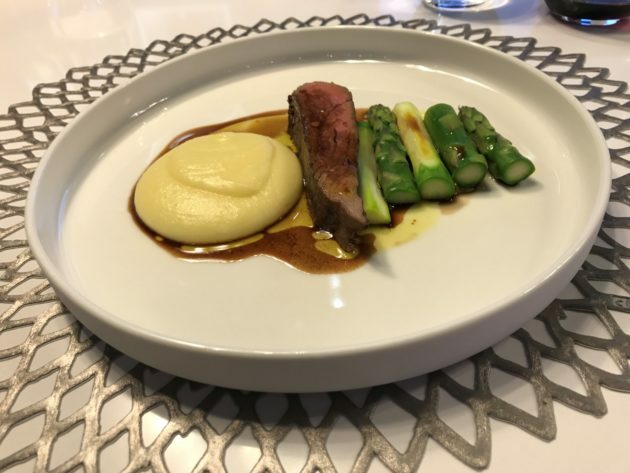 The fourth dish – 60 days aged Scottish rump, potato puree, asparagus, balsamic dressing – was always going to a crowd pleaser. The beef was so tender. My only wish was that there was more steak! The first three courses served on the evening were paired with a Nordic apple wine from varying stages of the fermentation process. Each wine differed in sweetness and sharpness to perfectly complimented the dish. The beef was served with an Argentinian/Lithuanian red wine: the Pinot Noir and Malbec grapes were grown in Argentina and the wine produced in Lithuania. The final dish – ricotta doughnut with cream cheese – was served with an elderflower schnapps and was the perfect end to meal that was created with Passion and Precision. Overall this event was amazing and the service at Miele was so smooth and the atmosphere so relaxed it created a friendly intimate dining experience. Our luxury furniture showrooms in London display a variety of Miele appliances within our bespoke kitchen furniture room sets, which customers are welcome to see. Please call to arrange an appointment to discuss your project over a coffee or contact us at enq@mccarronandco.com.